Nothing like a little mental break to help clear out the cobwebs and blow away the fog impeding clarity of thought. As is typical for me when I recognize the connectedness of initiatives that have been announced since my last post, I went back to my bookshelf for a little perspective. In this case it was to a short story Ayn Rand published in 1970 called “The Comprachicos,” where she wrote about the effects of the progressive education in the 60s grounded in John Dewey’s philosophies. This was education designed to cripple the mind and undermine its ability to accurately deal with reality. Sound familiar? Rand created a superb metaphor for what this type of Competency/Ideas first, instead of facts, education could do to the mind of a high school graduate by comparing it to the faculty of sight. It is a bit unnerving, isn’t it, to know that Rand was worried about where the behavioral sciences wanted to go with the mind even back in 1970? She even had a term for it–the student’s “psycho-epistemology.” So our student would be trained to use words and concepts like a parrot and believe they had ‘understanding’. To be willing to transfer those ideas and concepts to new situations where an expert would know their use was inappropriate–the Inapt Analogy we can call it. Without facts though, the student will not. In the Trilogy I just finished I argued that it appears to me to be a consensus about what education should be in the future and that politicians and think tanks from the so-called Right and Left, admittedly Progressive or declaratively conservative or “for limited government and markets,” seem to be describing a common vision. That vision again takes us back to John Dewey as Steven Rockefeller described his vision of Democratic Humanism. It would act as a religious faith best implemented through the schools and other social institutions. So when someone pitches education grounded in Conceptual Understandings, Guiding Ideas, Cross-Cutting Themes and Concepts, or other ways to describe the same general instructional practice, remember why John Dewey wanted this technique to become the core of education. This is true even if the pitch person insists this technique is actually a form of classical education or intended to mold character in desirable ways. Remember all the current emphasis on relevance and real world problems? Evidence-based policy making using data? In Dewey’s vision for an education that can lead to a reconstruction of society, emphasizing moral issues plays a crucial role. Students are expected to regularly identify “the causes of moral and social problems in concrete situations and on framing ideals with reference to the available means for overcoming such problems.” So ideals need to be connected to real world action. Otherwise, “ideals that are framed apart from the study of problems and possibilities in concrete situations are dreams, wish-fantasies, and useless as instrumentalities in directing practical affairs.” Anyone unclear as to why the new federal Every Student Succeeds Act requires not tests per se, but that states use performance assessments that involve activities and tasks to see if the stipulated learning is occurring can simply reread those two sentences. If it’s not action-oriented it may not guide or motivate future behavior. Likewise, if school is merely intellectual, the desired future behaviors may not occur. Social and emotional learning, whatever the given rationale, a Whole Child emphasis, Head, Heart, and Hand, as well as soft skills, are all consistent with what Dewey also recognized–the Role of the Heart in Moral Life. That way “prizing and appraising unite in the direction of action.” Dewey and every other progressive since culminating now in where Deeper Learning (pushed by the Hewlett Foundation as part of 21st Century Learning) is going recognizes that “Reason divorced from emotional involvement has no moving power.” Can you say student engagement as a necessary 21st century classroom practice to be an effective teacher? Dewey’s conception of education and learning fits perfectly with what ESSA now requires and Competency education generally. It fits with the kind of effectiveness that will get a school charter renewed and allow a CMO (Charter Management Company) to expand. It fits with what will make online learning an example of Best Practices for Student Growth. In none of these instances though is the Learning about the transmission of knowledge in a traditional sense. No, it’s about what kind of person the classroom activities are helping to create. “Growth means reinforcing those habits that contribute to human well-being and reconstructing those habits that do not.” Since none of us can even get an honest answer from most of the advocates for the Common Core as well as against it as to what they really envision for 21st century education, do not expect to be the arbiter of what constitutes your own or your child’s well-being. For Dewey then and for any school or other education provider wanting access to taxpayer money now (federal, state, or local), “learning means an increased perception of the meaning of things that leads to a modification of character (i.e., of basic dispositions and attitudes). In short, growing and learning involve the reconstruction and transformation of the self leading to an improved capacity of the self to adjust to its environment and to control and direct subsequent experience. Guess what? If, like me, you are an expert on the actual implementation it is easy to read that biography of Dewey and recognize the actual current significance. For those of you with more of a life than I have managed since I started researching and writing on all this, first of all I congratulate you. Secondly, let me call everyone’s attention to two examples in just the past week quietly putting Dewey’s vision into widespread effect without even using his name. A similar end result comes from this paper http://asiasociety.org/files/A_Rosetta_Stone_for_Noncognitive_Skills.pdf except it admits it wants to restructure the emphasis in primary and secondary schools. The omnipresent rationale, as usual, is that this personality and psychological emphasis is necessary for future success in college, career, and life. The real reason, as is true of anything emanating from a Rockefeller-funded philanthropy like the Asia Society, is to advance the vision of the future Dewey called Democratic Humanism and others call Marxist Humanism. As Dewey, Ayn Rand, and Uncle Karl all knew and we need to recognize to protect ourselves and our children, collectivists need to target the emotions and personality to realize their plans for us. Why? Dewey insisted that “unrest, impatience, irritation, and hurry that are so marked in life are inevitable accompaniments of a situation in which individuals do not find support and contentment in the fact that they are sustaining and sustained members of a social whole.” That’s what education that targets the personality and forces regular practices of altruism and actions grounded in provided ideas can all be manipulated to do. That’s why we have such a coordinated push now. If terms like Marxist Humanism seem off-putting, let’s just translate it as Dewey and his biographer Steven Rockefeller did and ask “Can a material, industrial civilization be converted into a distinctive agency for liberating the minds and refining the emotions of all who take part in it?” If a politician claims to want Quality Education for All Students, you might want to inform him or her as to what that actually entails. When I get upset about the 2014 Bipartisan and Bicameral piece of federal legislation known as WIOA that all the candidates running for President who are US Senators voted for, it is because it fits perfectly with Dewey’s insistence that a planned economy would be needed for democratic socialism to be achieved and it was best implemented at the local level. After all, what is WIOA but legislation with the effect of controlling the ends of education as well as allowing for “social control of industry and the use of government agencies for constructive social ends” just as Dewey sought. Let me close by pointing out that those of us not employed by the public sector or businesses getting taxpayer dollars are unlikely to find any of these desired ends particularly constructive. Did anyone guess that we had embarked on another Trilogy, except this time it was in Reverse Order as my personal experiences starting with a phone call to my home on December 17 sent me looking for answers? For a while now, the false narrative being constructed by various employees or allies of the Atlas Network members has both interested and angered me. Angered because it is frequently built on parroting some of my insights and research conclusions. Read Robin’s book, pretend to be an expert, get people to trust you, and take them somewhere I would never go. For example I would never describe Bill Ayers and Linda Darling-Hammond as “Marxist Humanists” because they are admitted Marxists and rather proud of it. Hint: this is why Ayers was willing to promote violence. Marxist Humanism (see tag) is a belief that because capitalism has reached a certain stage of technological feats, namely computers and the Internet and communications technology generally (abbreviated ICT), there is now enough prosperity in the world that there need be no poverty anymore within countries or anywhere around the world. It’s why the UN’s Post-2015 plans for us are called “Dignity for All” by 2030. As one of my UN news blurbs put it after New Years, we are now Post-2015 and this agenda has begun. Understanding it accurately is very important. That gets me back to that phone call. After hanging up in anger at what was said and pouring myself a glass of wine while I made dinner, I began to think about what had changed that day. Well, I had made a comment on the blog that I had ordered William Easterly’s book The Tyranny of Experts that had been an Atlas Network supported Hayek Lecture in London. So I decided dinner could be late, went down and wrote up notes on what was said in the phone call, started looking for financial connections among the known players, and examining commonalities as they popped up. In other words, I started behaving like the Due Diligence experienced lawyer I actually am analyzing a set of facts. I also got up early the next morning and proceeded to see what was in the Easterly book that people might not want me to grasp. That’s what I meant about a Reverse Trilogy as we started with explaining what a Nyaya concept of justice was and how I knew that Easterly’s book did not accurately portray Hayek’s thoughts on the subject of economic and social rights. I have more than a provided talking points knowledge of Hayek as that post laid out. I also know what Marxism Humanism looks like and Easterly’s book and the Atlas Network’s support for it does give good reason to start to whitewash what the term actually means. For parents, Linda Darling-Hammond’s (LDH) pushes in education and Bill Ayer’s past make them known nightmares to be avoided. We have talked about Amartya Sen and his Justice concept and Development as Freedom in the first two posts. He is laying out a Marxist Humanist vision as nyaya and really so is Easterly in his book. If no one has ever actually explained MH correctly though and you now connect it with Ayers and LDH, that actual reality will be missed. Sen coordinates a great deal with Professor Martha Nussbaum (also tag) on what they call Human Capability Theory, which also describes where P-12 education globally is going. If anyone is thinking I cannot actually tie all this to Uncle Karl, they do not have a copy of Democracy in a Global World covered in the last post. I went into that described alliance for good reason. Nussbaum also wrote a chapter and she tied the vision repeatedly to Uncle Karl by name. It’s also another reason why I found the open-ended Con Con advocacy from the Texas Governor so pernicious. The Chapter was called “Constitutions and Capabilities” and here’s a sample of the kind of direct ties I mean. That’s what Easterly called for too without tying it to Marx. It’s what the Atlas Network’s members are actually promoting when they push his work or Sen’s. Back to my story of why I spent so much time researching over the holidays. I know John Dewey backwards and forwards from researching my book, but until I saw this post http://www.greattransition.org/publication/the-earth-charter-at-15 I did not know that Steven Rockefeller of the famous family had also written a bio on him published in 1991 called John Dewey: Religious Faith and Democratic Humanism. I ordered it in part because so many of the people who appear determined to control the narrative about what is really going on with the Common Core also aggressively wear their religious faith front and center. In fact, it seems to be a selling point on why their analysis can be trusted. An example that had flowed out of my research was the Stand in the Gap Tour in fall of 2014 that David Barton had participated in. I had listened to a video of his speaking at a church in Dothan, Alabama and his description of what was desired reminded me of the cybernetic prearranged structuring of the Mind the behavioral scientists and admitted Leftists also want. That made Rockefeller’s book even more pertinent. As I read the chapter on “Democracy, Education, and Religious Experience” in particular I could see that this same Deweyan vision would create a desired worldview and amenable personality that would also work for a Muslim theocrat wanting to reconstruct the world starting at the level of the human mind (Tarbiyah) or a Christian fundamentalist also wanting to push social justice in the here and now. I pulled the post title from the book and Stimulating the Inner Springs also fits with what the Hewlett Foundation and the CCSSO today push as the requisite Deep Learning. Isn’t this the real reason for wanting to control the narrative on education? Common means and common ends among interest groups and think tanks that are supposed to abhor each other? When I also mentioned the other day that Charter Schools that use cybernetic methods and adaptive personalized online learning are in a position to reap huge sums under the new Every Student Succeeds Act since those methods of manipulating the Inner Springs are effective and thus “evidence-based,” suddenly a drumbeat began online. That ended in that Project Veritas video that the Common Core was about textbooks companies wanting to make money. Well, they do but that is disinformation in an education environment where textbooks are going away. In other words, like the phone call at home, do not write about the CMOs or online curriculums that also stand to benefit financially from insisting they are “100% Common Core Free” or who the financial backers are. No one may notice that the methods used are cybernetic and target those inner springs while telling parents this is a form of Classical Education. John Dewey understood that education “is a means of creating individuals” and David Coleman, Bill Ayers, LDH, and UNESCO are not the only parties at the education table interested in creating a certain kind of personality to fit with a desired vision of society and the future. In other words, what ESSA calls “personalized learning with adaptive data” that entitles its pushers to funding as 21st Century Schools. It’s not just the admitted Left wanting to target, like Dewey, “the whole feeling, thinking, and willing person.” That’s why the parroting of values, attitudes, beliefs, and behaviors functions to inoculate the listener from recognizing that the person they are listening to may also have a comparable agenda. It’s not just the admitted Left and Dewey who want to frame what ideas are salient to the listener and what is likely to get ignored. Politics by Think Tank is all about controlling the Narrative. Well, yes it does because all the false and controlled narratives keep the nature or existence of that control invisible. They make it seem like only a David Coleman, Linda Darling-Hammond, Bill Ayers, or other admitted Leftists have this goal for education in the 21st century. Lots of good reasons to control the Common Core narrative and guide and frame popular perceptions. Call me the mom who refused to play along and notices too much. Collectivism is one of those loaded words that sounds like I am trying to create a furor. Unfortunately, in this case, whatever the personal intentions of Texas Governor Abbott when he called Friday, January 8, for a Constitutional Convention, the actual release http://gov.texas.gov/files/press-office /Restoring_The_Rule_Of_Law_01082016.pdf may be one of the more deceitful documents I have ever read. It is deeply irritating to continue to be referred to as one of ‘the governed.’ Although since I live in Georgia, perhaps it is only Texans that are to be quietly subjugated at this point. Perhaps the author of the paper, a Texas Public Policy Foundation (another Atlas Network member) employee, Thomas Lindsay, who was previously with the National Endowment for the Humanities, is unaware that the phrase ‘We the People’ is now being used by radicals all over the world to promote the concept of a binding, collectivist, normative view of ‘democracy’. Maybe the call of UT-Texas prof Sanford Levinson in his 2006 book Our Democratic Constitution: Where the Constitution Goes Wrong (And How We the People Can Correct It) for just such a Con Con that is tied to the Soros-financed American Constitution Society’s desire to have a new Constitutional vision by 2020 (began in 2005 as explained here) http://www.invisibleserfscollar.com/progressive-polyphonic-federalism-invisibly-binds-people-and-places-to-the-just-society-vision/ was somehow news to TPPF and Dr Lindsay. It certainly looks like a Convergence, however, especially given all the insistence in the paper that the Rule of Law is the core value America was founded on. Excuse me? Maybe it’s just a coincidence that ‘We the People’ just happens to be the name of an initiative Community-Organizer Extraordinaire Harry Boyte, who inspired President Obama and has worked on White House education initiatives, has created to be the so-called Third Way, neither Left or Right, to use education to get his ‘cooperative commonwealth’ vision in place. https://www.kettering.org/sites/default/files/product-downloads/We_The-People_Politics.pdf Maybe it’s a coincidence that Boyte created that paper originally for a Dewey lecture in 2007 and it just happens to fit John Dewey’s vision for how to create the right kind of consciousness via education to fit a normative democracy where the law would bind everyone to the common good vision. The one laid out in the 2008 Democracy in a Global World book that I tracked from looking at Amartya Sen’s work covered in the last post. Let’s start pushing on all these ‘coincidences’ headed in a common direction. The quote that “Our nation was built on one principle above all others–the Rule of Law” is not simply false, it is false in a way that is useful in jettisoning the principles our Nation and its existing Constitution were founded on–the primacy of the individual. Lindsay is correct that at the federal level, politics is broken. That dysfunction, however, is no reason to reverence the Law so state and local governments can turn each individual into merely the Governed. It is facetious to argue, as that Con Con advocacy paper does, that “The whole point of the rule of law is that we comply with it even when we do not want to; otherwise, it is the will of man and not the rule of law that reigns supreme.” Huh? That’s the kind of sophistry a wannabe tyrant would assert. A conception of the Law grounded in the visionary who gave rise to both Fascism and Communism as the basis for a call to jettison the current Constitution is apparently what the admitted Left as well as quite a few Atlas members want as well. A reverence for individuality is an obstacle to the Convergence apparently. The US Constitution is in the way. I am going to use a particular essay “The Global Public and Its Problems” to illustrate what was meant by John Dewey by the term ‘Creating a Public’ through educational practices. In 1927 Dewey wrote a book The Public and Its Problems which called for a communitarian form of citizen loyalty as being necessary to create the public will and values to make democracy sustainable. This is not democracy as some kind of representative government with periodic elections, but democracy in the sense that Boyte calls the cooperative commonwealth, Marx called the Human Development Society, and the UN now calls Dignity for All by 2030. 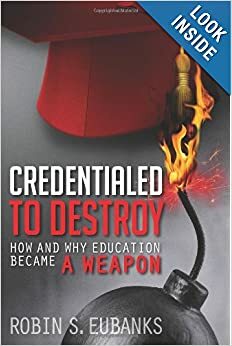 In other words, there are reasons that the concepts from a 1927 book remain relevant in the 21st Century as the first chapter of my book Credentialed to Destroy made clear. Dewey defined the Public as a community where “its members recognize a common interest in confronting problems they all face and see resolving these problems by means of collective action as a common good.” Regular readers will recognize the current concept of Fostering Communities of Learners as the measure of what constitutes being an Effective Principal as using the school to now prepare students for a future where they get to be a mere member of Dewey’s concept of a Public. Needless to say, Dewey’s Public needs a strong, anti-individual view of the law to bind individuals to this broader vision. Couldn’t we describe that as the model for today’s Convergence we are seeing by the so-called Left and Right think tanks? Doesn’t that fit with the video in the comments of the previous post of Pastor Rick Warren this year moderating a forum with Professor Cornel West and Professor Robert George, the founder of Atlas member–American Principles Project? Have we once again returned to Dewey’s view of education, political life, and social policy that the Eurocommunists also used that “resisted both sides of this orientation by seeking common democracy building social projects.” I was at a forum last week where Policy Link founder Angela Glover Blackwell was the Keynote Speaker and the admitted radicals seem just as hesitant to admit they are now working with Big Business and Chambers of Commerce to advance their vision of a Just Future. No wonder Atlas member employees suddenly seem so fond of citing Justice Brandeis that “it is one of the happy incidents of the federal system that a single courageous state may, if its citizens choose, serve as a laboratory; and try novel social and economic experiments without risk to the rest of the country.” If the citizens consent. That must be why the University of Texas-Austin is working with Stanford on the national Growth Mindset study and doing such a loud and explicit declaration of experimenting on students to change their conscious and unconscious mental models. All consensual. Not. Reverence for the Rule of Law and Education for Democracy are just the thing in a nation where a Republican Governor calls for a Constitutional Convention with a paper that tells us again that “It is wise, therefore, in every government, and especially in a republic, to provide means for altering, and improving the fabric of government, as time and experience, or the new phases of human affairs, may render proper, to promote the happiness and safety of the people.” That’s the view of Law from the Continent where as Aldous Huxley noted, rights are taken, but never given. That’s the world of the Governed, the serf, and the subject, which is indisputedly where both WIOA and ESSA and a world where the White House has a Behavioral and Social Sciences Team working to change the nature of citizens at the levels of their minds and personalities. I just was not expecting the State of Texas to play such a prominent role in launching this new view of education and what it will now mean to be an American in the future. Remember with Dewey’s methods comes the totality of his underlying vision. Suddenly the title’s reference to Collectivism is perfectly on point. Can Bicameralism and Proper Presentment now bind individuals to everything 21st Century state and local governments choose to impose? Hope everyone had a great holiday season. I took an unplanned break from writing, but not researching, since the last post. With the statutory language of the Every Student Succeeds Act (ESSA) now in place, the plans for the future I recognized when I read my state’s (Georgia) WIOA Plan, and other shenanigans offline surrounding false narratives, I decided to get to the bottom of all the interrelated parts. Let’s just say if my understanding was 20/20 on the real agenda behind all these education ‘reforms’ by the time I finished my first book Credentialed to Destroy, the acuity now can best be described as X-ray vision with the capacity to cut through metal when called for. Since the fundamental transformation of each of us, our society, and the economy has been decreed federally via Bicameral and Bipartisan fiats like ESSA and WIOA to be imposed locally by elected officials, let’s keep following the trail in 2016. After all, some of you may get the chance to quiz the candidates about why they supported these measures or simply offered ineffective opposition. “Why did you vote to bring Fascism to America?” is such a conversation grabber. To be ready for such an exploration let’s add a few more words and phrases to our arsenal of explanations. In December I saw this announcement https://www.atlasnetwork.org/news/article/entrepreneurship-center-of-easterlys-hayek-lecture-on-poverty-alleviation and decided to get Easterly’s book. After all, I had spent much of 2015 arriving at the conclusion that many of the members of the Atlas Network like Heritage, Cato, and AEI seemed fully on board with a planned economy and education that focused on changing the student at a social and emotional level. I found the promotion of both Easterly’s work and that of Human Capability theorist Amartya Sen to be both troubling in its implications of a true agenda and fascinating at the same time. After all, if the so-called Left and Right have arrived at a synthesis and are not planning to tell us lest it interfere with fundraising, then our answers are located in who gets promoted. If this discussion seems esoteric and a bit like an odd vocabulary lesson, all the language in ESSA about ‘evidence-based’ is simply another way to describe a nyaya vision of entitled intrusion and tracking of what the student has internalized to guide and motivate their behavior. ESSA didn’t make that a permissible activity for the schools. It created a mandate. When the Georgia WIOA Plan called for “immigrants and other individuals who are English language learners” to acquire “an understanding of the American system of government, individual freedom, and the responsibilities of citizenship,” it is that concept paper above’s vision, not what James Madison had in mind. The individual freedom is again straight out of Sen’s famous book Development as Freedom. In fact, it is as if the Hewlett and Ford Foundations and Generation Citizen all knew Sen’s work where “different sections of society (and not just the socially privileged) should be able to be active in the decisions of what to preserve and what to let go.” If governments and think tanks have declared that we are transitioning to “an accomplishment-based understanding of justice” because in the 21st Century “justice cannot be indifferent to the lives that people can actually lead” and this nyaya view of an entitled justice is to be sculpted in the “minds of men” [and boys and girls] via formative assessments and the real meaning of assessing annually for Higher Order Thinking and Understanding, we need to recognize this reality and the nature of the shift. When Bloomberg expands the metro areas participating in What Works Cities, this is the nyaya theory of justice in play as well. It is ironic that the Atlas Network seems to regard all these affirmative initiatives as what Hayek would have supported as part of his spontaneous order vision. As my book pointed out, Hayek took a dim view of trying to achieve conscious direction invisibly via internalizing the desired values, attitudes, and beliefs to guide wanted behaviors. I was pretty sure I had something directly on point to refute this odious vision of the future as Hayekian. Since I have a depth of knowledge that is anything other than just sound bytes and a very large library of resources, I found what I was looking for in Volume 2 of Law Legislation and Liberty. That volume has the subtitle The Mirage of Social Justice. Anyone else get the feeling that which books or even chapters of Hayek’s get assigned or quoted is now greatly circumscribed? Censorship by omission we can call it. Hayek knew what we all need to know as well now that the plans for conscious direction are to be developed in students,’ and apparently immigrants,’ personalities. Have I explained yet that in countries like Scotland that are further along this road of social transformation via education ‘reforms,’ the very Experiences and Outcomes for each student are specified? The “Es” and “Os” they are called in what is the best example of the intended deliberate reorganization. Welcome to 2016 as the Year of Epiphanies.